Objectives: The specific objective of this in vitro study was to determine whether the current flowable resin composites can establish an effective seal in repairing noncarious amalgam margin defects. Material and Methods: A total of 30 freshly extracted caries-free human third molars were used for this investigation. 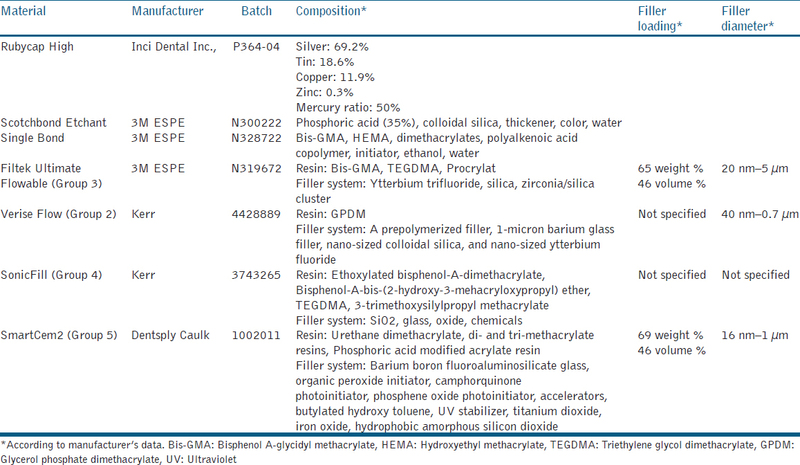 Class I preparations with a standardized 160-μ marginal defect were made by condensing amalgam against a Mylar strip. Accelerated aging and corrosion protocols were then applied to simulate oral conditions. The prepared teeth were randomly divided into five groups (n = 6 per group) according to the repair material employed as follows: (1) no treatment (control); (2) self-adhering flowable resin composite (Vertise Flow); (3) flowable resin composite (Filtek Ultimate Flowable); (4) sonic-activated resin composite (SonicFill); and (5) self-adhesive cement (SmartCem2). Specimens were thermocycled again and then immersed in 5% methylene blue at 37°C for 24 h. For dye-leakage measurements, specimens were sliced longitudinally using a low-speed diamond disk. Results: The results indicated that the flowable resin composite material significantly reduced marginal microleakage compared to the control and SonicFill (P < 0.05). Conclusion: Current flowable resin composites were found to be adequate materials for repairing noncarious amalgam margin defects. Despite the decrease in the clinical use of amalgam restorations due to poor esthetic characteristics and potential mercury contamination, this material, mainly used in general practice, still provides the best cost-effectiveness as a direct restorative material. Amalgam restorations have been used with proven longevity for >100 years. The popularity of this material is based on its good mechanical properties such as wear resistance, easy handling, low technique sensitivity, and low cost. Although the quality of the amalgam alloy has improved, marginal sealing remains a challenge for the clinician. Repair of an existing restoration has been considered a minimally invasive and cost-effective alternative to total replacement. Repairing amalgam defects eliminates areas that are difficult for the patient to cleanse precisely. Various studies have shown that tooth-colored restorative materials can be used as a repair material for defective amalgam restorations. In recent years, development of tooth-colored restorative materials has accelerated. Flowable resin composites have been proposed as liners under a hybrid composite resin or for stand-alone use. Their viscosity eases material placement and improves adaptation to cavity walls. It is generally accepted that the use of materials with a low modulus of elasticity reduces marginal leakage. Thus, resin composite could be an option for repairing amalgam margin defects within the scope of minimally invasive dentistry. The aim of the present in vitro study was to assess the effectiveness of several current restorative materials that have been used as the sealing materials in repairing amalgam margin defects as an alternative to total replacement. The present study compared microleakage values of specimens to evaluate the effectiveness of these materials. The authors' hypothesis was that the microleakage values of the specimens would be within a clinically acceptable level after repair, but significant differences would exist between repair materials. A total of 30 freshly extracted caries-free human third molars were collected after the patients' informed consent had been obtained under a protocol reviewed and approved by the Ethics Committee for Human Studies, Istanbul University, Faculty of Dentistry, İstanbul, Turkey. Selected teeth were cleaned of any tissue remnants and other debris, disinfected in a 0.5% solution of chloramine T (Merck, Darmstadt, Germany), and then maintained in distilled water at +4°C for up to 1 month before testing. By the mean values obtained from measurements of the teeth (mesiodistal: 8.9 mm ± 0.78 and buccolingual: 8.3 mm ± 0.82), standardized occlusal Black Class I cavities were prepared by one operator to the following dimensions: 4.0-mm mesiodistal length, 2.0-mm buccolingual width, and 2.0-mm depth. The cavity dimensions were checked with a digital caliper to standardize the cavity size. All internal line and point angles were rounded. No bevels were placed at any of the cavosurface margins. A diamond bur (ISO No: 806 314 157534 014, Komet, Lemgo, Germany) in a high-speed handpiece (625DN Super Torque; KaVo, Biberach, Germany) with air–water spray was used, and new burs were used after every four preparations. A standardized 4-mm wide section of mylar strip (Alfred Becht GmbH, Offenburg, Germany) was four-folded, lightly coated with a water-soluble lubricant (Gleitgelen, Montavit GmbH, Absam/Tirol, Austria), and placed against a suitable buccal or lingual wall within each of the preparations. The preparations were then filled with precapsulated admixed alloy (Rubycap High, Ruby Dent, Inci Dental, Inc., Istanbul, Turkey), and then activated and triturated in a high-speed amalgamator for 15 s according to the manufacturer's instructions. The amalgam was incrementally placed, condensed into the cavity until it was slightly over-filled, and then carved. After carving, an acorn-shaped burnisher was used to burnish the amalgam surface and margins. All specimens were immersed in distilled water immediately after amalgam placement. The mylar strip was removed, and the amalgam surfaces were polished with finishing carbide burs and abrasive rubber cups 24 h after condensation. The teeth were stored in distilled water for 1 week at 37°C to allow the water-soluble lubricant to leach from the marginal defect area of the preparations [Figure 1]. The specimens were subjected to an accelerated aging protocol as described by Matyas et al. According to this protocol, the specimens were exposed to ammonium sulfide gas for 24 h and then immersed in Ringer's lactate solution (Vacoliter, Eczacibasi-Baxter, Istanbul, Turkey) for 24 h. This cycle was repeated three times. The protocol was completed by immersing the specimens an additional time in Ringer's lactate solution for 24 h. The accelerated aging protocol produced corrosion equivalent to approximately 2 years of intraoral exposure. The specimens were subjected to thermal cycling twice (before and after restoration-placement procedures) for 500 cycles between 5°C ±2 and 55°C ±2, with a dwell time of 30 s for each submersion and a transfer time of 20 s between baths. The following protocol was used for specimens repaired by Vertise Flow (Kerr, Orange, CA, USA). The marginal defective area was washed thoroughly with water spray and then air dried with maximum air pressure for 5 s. Vertise Flow was injected into the defective area with the dispensing tip provided. According to the manufacturer's instructions, Vertise Flow was brushed with moderate pressure for 15–20 s, excess material was removed with the provided brush, and the restoration was then light cured for 20 s.
The entire marginal defective area was conditioned for the resin composite material with 37% phosphoric acid (Scotchbond Etchant, 3M ESPE, St. Paul, MN, USA) for 15 s, and then rinsed for another 15 s with distilled water. The cavity was dried with a gentle air stream and keeping the dentin moist. Single bond (3M ESPE, St. Paul, MN, USA) was applied to the etched area using the brush tip, and then air-dried with a 2-s air burst from an air-water syringe. The bonding agent was then cured for 20 s. The application area was visually inspected to ensure that it was glossy, and then the defective area was repaired with flowable composite resin (Filtek Ultimate Flowable, 3M ESPE, St. Paul, MN, USA). The etchant material and the bonding agent, which were similar to those used in Group 3, were applied to the marginal defect according to the manufacturer's instructions. A unidose capsule was properly inserted into the SonicFill Handpiece (Kerr, Orange, CA, USA), and the unidose tip was placed into the cavity. The SonicFill handpiece was activated, and resin composite was carefully dispensed into the marginal defect with attention to confining it to the defect and adjacent enamel and amalgam margins. The resin was then polymerized for 20 s with a light-curing unit following the manufacturer's instructions. The following protocol was used for specimens repaired by SmartCem2 (Dentsply/Caulk, Milford, DE, USA). A small amount of material was dispensed from the dual-barreled automix syringe and discarded. A mixing tip with a needle-shaped ending was installed on the cartridge. Without delay, cement was applied to the entire internal surface of the marginal defect. The cement was brushed gently, and excess material was removed. After 3 min of polymerization, the specimens were maintained wet. After the restoration placement procedures, resin composite surfaces were polished with Sof-Lex (3M ESPE, St. Paul, MN, USA) discs. The apices of the teeth were sealed with chemically cured glass-ionomer cement (Ketac Molar Easymix, 3M ESPE, St. Paul, MN, USA). Two layers of nail varnish were successively applied (the first layer was allowed to dry before the second was applied) to the entire surface of the teeth except for a 1-mm wide zone around the cavosurface margins of each restoration. Without delay, the specimens were immersed in 5% methylene blue at 37°C for 24 h, and then rinsed in tap water. For dye-leakage measurements, specimens were sliced longitudinally using a low-speed diamond disk (1000 Isomet Buehler, Ltd., Lake Bluff, IL, USA) with water coolant. Digital photographs were made of sectioned surfaces of all specimens using a compound stereomicroscope (Olympus SZ61, Tokyo, Japan) fitted with a digital camera (Olympus SC30, Tokyo, Japan) at ×30 magnifications. Microleakage measurements were made on tooth sections with image analysis software (Cell^A, Olympus-SIS GmbH, Münster, Germany). The microleakage distance from the margin to the determined limit was expressed in μm, and the half tooth with the higher score was used for further analysis. Analyses were performed using a statistical program (IBM SPSS Statistics 20, SPSS Inc., Chicago, IL, USA) using one-way analysis of variance (ANOVA), Dunnett's test, and the Tukey's test at the 5% level of significance. [Table 2] shows the mean microleakage values and standard deviations for the control and experimental treatment groups. ANOVA revealed a statistically significant difference among groups (P < 0.0001); therefore, the data were analyzed further using the Dunnett's and Tukey's tests. Dunnett's test indicated that the microleakage values of all repaired groups except Group 4 (SonicFill) were lower than those of the nonrepaired control group (P < 0.05). The analysis of data using the Tukey's test showed no significant difference in microleakage values among Groups 2 (Vertise Flow), 3 (Filtek Ultimate Flowable), and 5 (SmartCem2). However, among these three treatment groups, the lowest mean microleakage values were obtained from Group 5, and the highest values were obtained from Group 2. When the mean microleakage values of the nontreated control group and Group 4 were compared, the microleakage from the control group was higher than that of Group 4. However, statistical analysis revealed no significant difference between the control group and Group 4 (P > 0.05). Failure of restoration may contribute to marginal staining, adverse pulpal response, postoperative sensitivity, and secondary caries. Replacement of restorations requires an additional sacrifice of healthy dental structure and should be avoided if possible. Therefore, alternatives to the replacement of restorations may constitute a mechanism for the preservation of tooth structure. Previous studies have shown that repair is an effective treatment alternative for amalgam restorations that were originally considered defective. Laboratory studies have also attested to the success of amalgam repair. Previous in vitro studies have suggested that the sealed margins of defective amalgam restorations performed better than restorations that were not sealed. Gordan et al. indicated that defective restorations that have anatomical form and a Bravo rating for clinical characteristics other than marginal integrity do not need to be replaced immediately. They also emphasized that repair would be the most conservative option. In this in vitro study, an attempt was made to assess the effectiveness of several currently available restorative materials in repairing noncarious amalgam margin defects. This investigation clearly revealed that the use of adhesives is a promising approach that avoids or at least markedly reduces microleakage in selected noncarious amalgam margin defects. Within the limitations of this in vitro study, the hypothesis of this investigation was accepted. When judging a restoration, the first step is to decide whether it is clinically acceptable, and in case of unacceptable scoring, to decide whether repair or replacement would be the better option. Hodges et al. indicated that there is a direct association between gap width and recurrent caries in occlusal margins of amalgam restorations. A difference of 187 μm was found between the mean gap width of the recurrent caries sites and the noncarious sites. Therefore, four layers of mylar strip (160 μm width) were utilized to standardize the noncarious amalgam margin defect because the mylar strip can be obtained easily in a clinical situation, and the defect is well detectable by clinicians. To simplify this process, water-soluble lubricant was used and then removed after the procedure by storing the teeth in distilled water. To simulate oral conditions, the specimens were subjected to an accelerated aging protocol. According to this protocol, the specimens were exposed to ammonium sulfide gas and then immersed in Ringer's lactate solution; thereafter, preparation of the amalgam margin defect proceeded as described before. The accelerated aging protocol produced corrosion approximately equivalent to 2 years of intraoral exposure. Thermocycling is also widely used in dental research for accelerated aging.,, In the present study, the specimens were subjected to thermocycling before and after repair of amalgam margin defects. Flowable resin materials have been proposed as liners under a hybrid composite resin or for stand-alone use. Their viscosity eases material placement, and adaptation to cavity walls is improved. Several in vitro studies showed that flowable resin composites reduced microleakage,,,,, whereas other studies failed to confirm improved marginal adaptation.,, Therefore, four currently used resin composite materials with low viscosity were employed in the present study to repair amalgam margin defects. Their main advantages were high wettability of the tooth surface, ensuring penetration into every irregularity, and ability to form layers of minimum thickness; thus, improving or eliminating air inclusion or entrapment. One of the repair materials was an innovative self-adhering flowable resin composite, Vertise Flow that combines the essential components of an etchant, a primer/adhesive, and a composite into one material. In this way, the application time and technique-related sensitivity of the procedure are significantly reduced. Another repair material used in this study was a self-adhesive cement, SmartCem2. This luting agent has small-sized filler particles. SmartCem2 was included in this study due to its low viscosity and easy and fast applicability. These two materials can bond well too many different substrates including enamel, dentin, porcelain, metals, and composite. Data indicated that the repaired groups leaked less than the control group except for Group 4 (SonicFill). SonicFill is a sonic-activated composite material. Sonic activation lowers the viscosity of the material by 87% to allow for easy adaptation. Despite its low viscosity, liquefaction does not quite reach a flowable consistency, and SonicFill did not measurably improve the degree of protection against leakage. No significant differences in microleakage were found among treatment Groups 2 (Vertise Flow), 3 (flowable resin composite), and Group 5 (SmartCem2). Thus, regarding easy and fast applicability of the materials for noncarious amalgam margin defect repairs, Vertise Flow, and SmartCem2 provide a great benefit for the clinician. 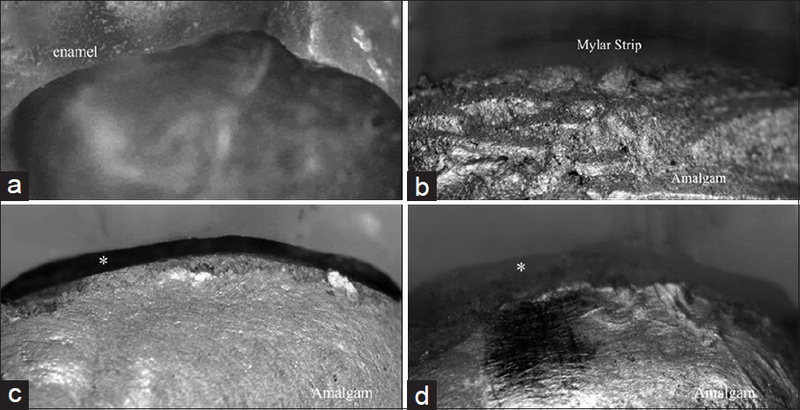 The specific objective of this in vitro study was to determine whether currently used flowable resin composites can establish an effective seal in repairing noncarious amalgam margin defects. Currently, available flowable resin composites were found to be adequate materials for repairing selected noncarious amalgam margin defects. Corbin SB, Kohn WG. The benefits and risks of dental amalgam: Current findings reviewed. J Am Dent Assoc 1994;125:381-8. Manhart J, Chen H, Hamm G, Hickel R. Buonocore memorial lecture. Review of the clinical survival of direct and indirect restorations in posterior teeth of the permanent dentition. Oper Dent 2004;29:481-508. Al Negrish AR. Reasons for placement and replacement of amalgam restorations in Jordan. Int Dent J 2001;51:109-15. Mondelli J, Steagall L, Ishikiriama A, de Lima Navarro MF, Soares FB. Fracture strength of human teeth with cavity preparations. J Prosthet Dent 1980;43:419-22. Berry TG, Laswell HR, Osborne JW, Gale EN. Width of isthmus and marginal failure of restorations of amalgam. Oper Dent 1981;6:55-8. Mjör IA. Repair versus replacement of failed restorations. Int Dent J 1993;43:466-72. Smales RJ, Hawthorne WS. Long-term survival of repaired amalgams, recemented crowns and gold castings. Oper Dent 2004;29:249-53. Ozcan M, Vallittu PK, Huysmans MC, Kalk W, Vahlberg T. Bond strength of resin composite to differently conditioned amalgam. J Mater Sci Mater Med 2006;17:7-13. Roberts HW, Charlton DG, Murchison DF. Repair of non-carious amalgam margin defects. Oper Dent 2001;26:273-6. Matyas J, Caputo AA, Cowie A. Burnishing and its effectiveness in sealing margins of amalgam restorations: A laboratory study. Oper Dent 1978;3:103-7. Kemp-Scholte CM, Davidson CL. Complete marginal seal of class V resin composite restorations effected by increased flexibility. J Dent Res 1990;69:1240-3. Gordan VV, Riley JL 3rd, Blaser PK, Mjör IA. 2-year clinical evaluation of alternative treatments to replacement of defective amalgam restorations. Oper Dent 2006;31:418-25. Hickel R, Brüshaver K, Ilie N. Repair of restorations – Criteria for decision making and clinical recommendations. Dent Mater 2013;29:28-50. Hodges DJ, Mangum FI, Ward MT. Relationship between gap width and recurrent dental caries beneath occlusal margins of amalgam restorations. Community Dent Oral Epidemiol 1995;23:200-4. Chuang SF, Jin YT, Liu JK, Chang CH, Shieh DB. Influence of flowable composite lining thickness on class II composite restorations. Oper Dent 2004;29:301-8. Korkmaz Y, Ozel E, Attar N. Effect of flowable composite lining on microleakage and internal voids in class II composite restorations. J Adhes Dent 2007;9:189-94. Ernst CP, Cortain G, Spohn M, Rippin G, Willershausen B. Marginal integrity of different resin-based composites for posterior teeth: An in vitro dye-penetration study on eight resin-composite and compomer-/adhesive combinations with a particular look at the additional use of flow-composites. Dent Mater 2002;18:351-8. Jain P, Belcher M. Microleakage of class II resin-based composite restorations with flowable composite in the proximal box. Am J Dent 2000;13:235-8. Olmez A, Oztas N, Bodur H. The effect of flowable resin composite on microleakage and internal voids in class II composite restorations. Oper Dent 2004;29:713-9. Malmström HS, Schlueter M, Roach T, Moss ME. Effect of thickness of flowable resins on marginal leakage in class II composite restorations. Oper Dent 2002;27:373-80. Neme AM, Maxson BB, Pink FE, Aksu MN. Microleakage of class II packable resin composites lined with flowables: An in vitro study. Oper Dent 2002;27:600-5. Luu C, Drechsler U. Viscosity change of SonicFill™ when subjected to sonic vibration. Orange, CA 92867. USA: Kerr Dental Materials Center; 2012.